Wedding anniversary gifts and ideas for when you need a bit of romantic inspiration! Don't stress... we've got some fabulous and unique ideas on this page we think they'll love! On this page we've collected some of our most popular printable anniversary gift ideas. 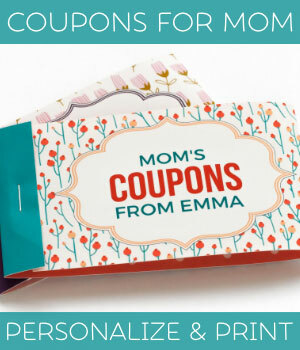 They are super easy to personalize at home (or at work... so your partner doesn't find out!) and a great way to show how much you care! 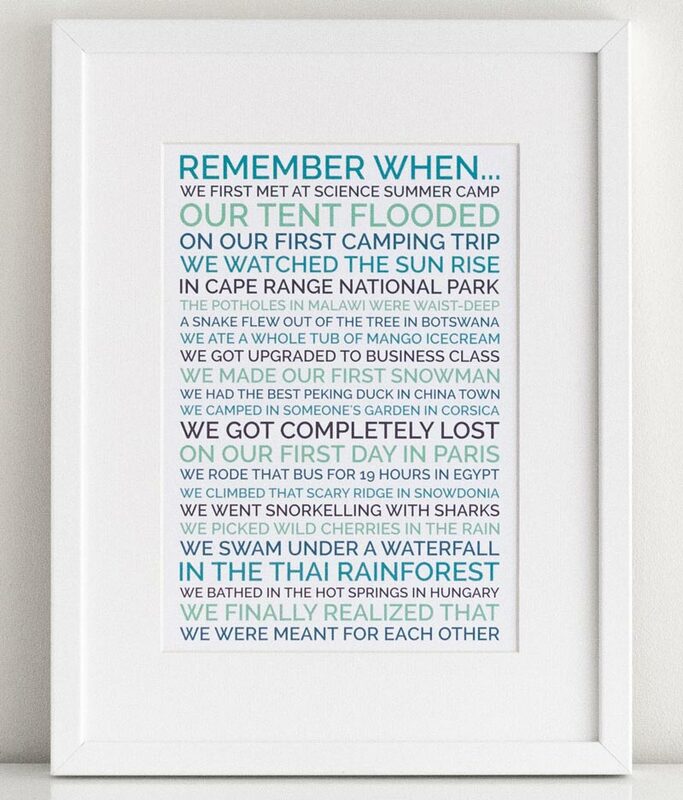 Our "Remember When" printable poster allows you to reminisce over all things you and your partner have done together. It reminds you of all those fun times you've shared and how special your relationship is. We take care of the design and formatting, so all you have to do is personalize and print. Your partner will feel so special that you've made something just for them! You can make this for your husband or wife, but it is also a wedding anniversary gift you can make for your parents when they are celebrating a special anniversary. Anniversaries are such a wonderful time to be romantic! 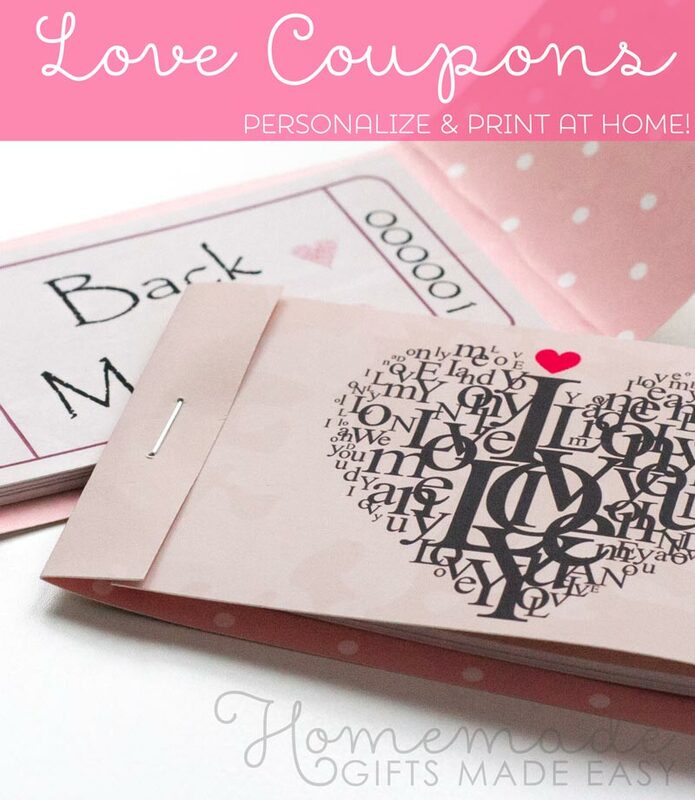 These printable love coupons are a gift that keep giving, and with editable text you can tailor them perfectly to your partner. 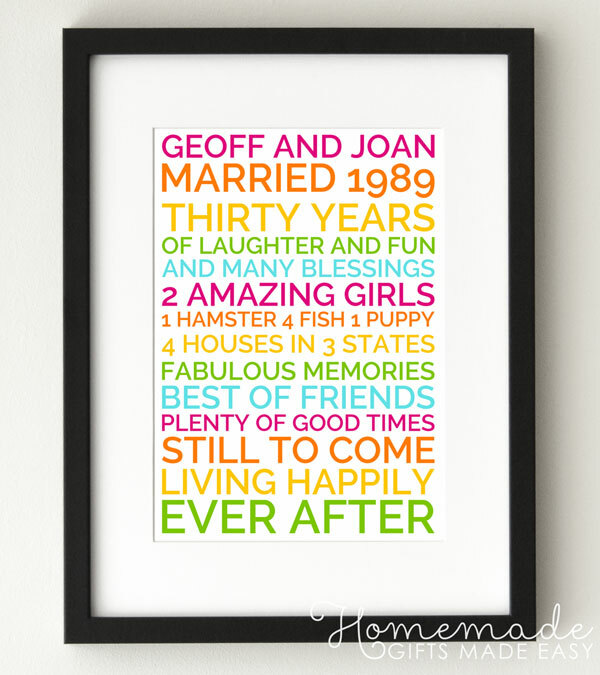 Create your own personalized poster with facts from the year you were married! It's a lovely way to reminisce over what was happening "back in the day..."
As this anniversary poster concept is still in development, you will be directed to birthday posters celebrating that year. All you have to do is edit the text to make it an anniversary poster. Have fun reminiscing! This super cute printable foxes poster celebrates all that's great about being part of a fabulous team together. 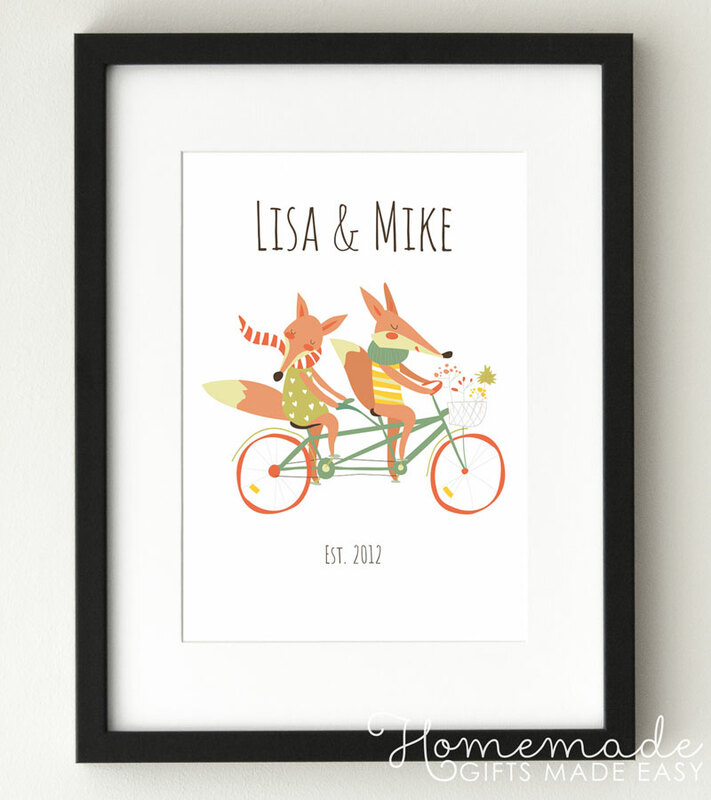 Whether "Foxy Couple", "Dashing Couple", or "A wheelie lovely couple since 2012" suits your style best, you can edit the top and bottom text to personalize this wedding anniversary gift so it's perfect for you. 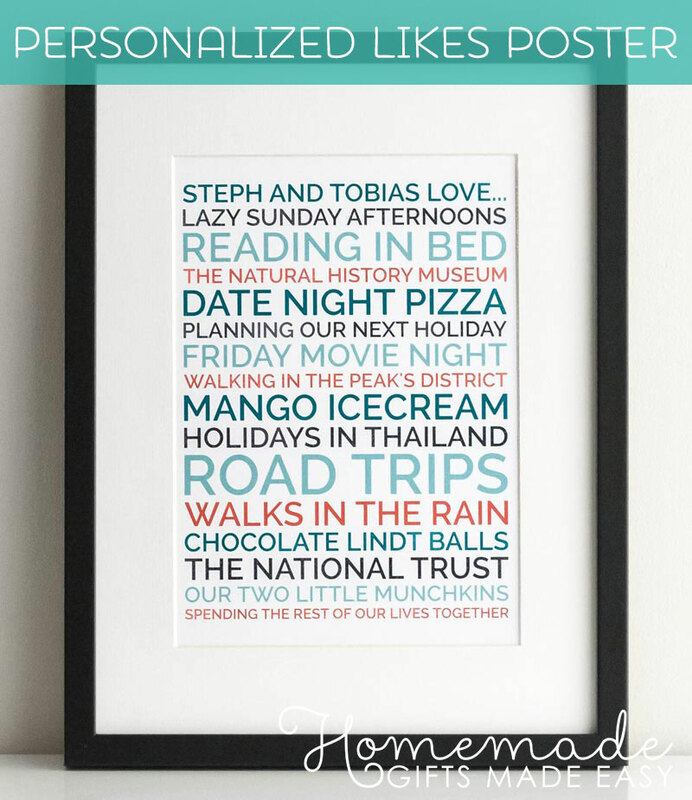 Make a personalised poster of all the things you love doing together! These posters are very quick to make and have lots of fabulous color palettes to choose from. It's such a simple idea and a great way to celebrate your relationship and why you like hanging out so much! Click here to make your own personalized perfect pairs poster. Or you could make a poster defining what love means for the two of you. I think this is a particularly wedding anniversary gift as it's so unique to you both. 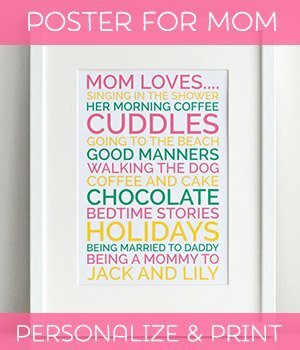 My husband actually came up with this poster design and made me a birthday poster this year with a definition of all the things he loved about me - it is adorable and made me feel so special! For many reasons sometimes it's easier to give cash for an anniversary gift... but cash can also be romantic! A couple of decorative hearts folded in a card is an unexpected nice suprise, and shows that you've taken time to prepare their gift. Do give it a try, it's not as complicated as it looks, promise! 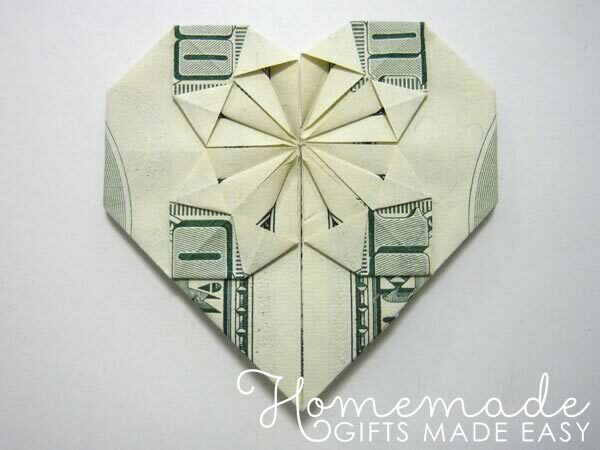 Learn how to fold cash into decorative hearts, flowers, and more with our step-by-step money origami instructions. This printable card is so fun because you can personalize it for the number of days you've been together! We originally came up with it as a Valentine's card idea, but it's perfect to accompany wedding anniversary gifts too! 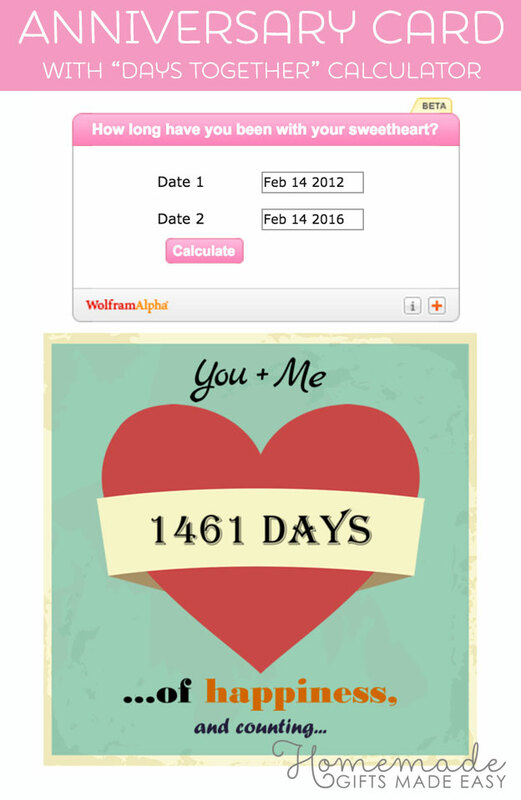 It's so quick to calculate how many days you've been together, and easy to download and print your free card at home. Click here to personalize your anniversary card. Sometimes the most touching wedding anniversary gift is a message telling your partner how much you love and care about them. These wishes, quotes, and poem collections might be just the romantic inspiration you need! We hope you enjoyed these wedding anniversary gifts and ideas, and that you've found something special you can make this year. Do check out our homemade Valentine gifts page for more craft-based romantic gift ideas, and there are plenty of general gifts and quotes on our homemade boyfriend gifts page too.